When It Comes To Entitlements, Obama Feels Heat From Left And Right : It's All Politics Despite his re-election and bolstered Democratic numbers in Congress, President Obama has far from a free hand to make a comprehensive deal with House Speaker John Boehner that would include cuts to entitlement programs. Strong resistance to that notion is coming from the political left — and with a warning. A protester at a fiscal cliff rally on Monday in Doral, Fla. Despite his re-election and more Democratic seats in Congress, President Obama has far from a free hand to make the kind of comprehensive deal House Speaker John Boehner and other Republicans are demanding — one that includes cuts to entitlement programs. Strong resistance to that notion is coming from the political left, including warnings that while Obama won't have another re-election, most of his allies on Capitol Hill will be facing voters again. "Any benefit cuts to Social Security, Medicare and Medicaid have to be off the table," said Ilya Sheyman, campaign director for MoveOn.org Civic Action, in an interview. "I think it's certainly true that no Democratic member of Congress — whether it's in the House or the Senate — should be surprised if they end up facing a primary after voting to cut Medicare, Medicaid and Social Security programs." Sheyman said the performance of political progressives in turning out the vote for Democrats in the recent election gives them the right not only to be heard but also to have their demands met that entitlements be left unscathed in negotiations to avert the combination of major tax increases and drastic spending cuts scheduled for the end of the year. That's a dangerous notion, says David Walker, who as comptroller general headed the Government Accountability Office from 1998 to 2008 and who endorsed Mitt Romney for president. "I'm concerned that liberals have misread the election and are overreaching," Walker said Tuesday at a U.S. Chamber of Commerce event. "There's actually no question that the president campaigned on more revenues and more [sacrifice] from the wealthy. I think it's legitimate for him to say that," said Walker. "But to say that he has more than that is not credible. And what we're hearing right now is we're hearing grand bargain-type numbers on revenues but not grand bargain numbers" for entitlement reform. Rep. Steny Hoyer, D-Md., the second ranking House Democrat, told journalists last week that "you've got to put everything on the table" in talks with Republicans. Even the suggestion got him in hot water, leading to social media demands for House Democratic leader Nancy Pelosi to oust Hoyer from leadership. Some activists urged like-minded progressives to raise their voices to get Hoyer to recant. "Seniors on Medicare did not cause our deficit — Bush tax cuts for the wealthiest Americans, two wars and Wall Street's recession did," a blog post on BoldProgressives.org argued. "They should not be asked to pay through their hard-earned benefits." "I agree that everything's on the table, but that doesn't mean we're for everything," he said. "Some of those are not advisable. ... We need to protect and strengthen Social Security and Medicare." Progressive groups aren't the only ones poised to give the blues to any Democratic policymaker willing to discuss entitlement reforms; there's also the ostensibly nonpartisan (and powerful) advocacy group AARP. "On behalf of our 37 million members and their families, AARP will fight for an open, thoughtful public discussion about how to strengthen Social Security and Medicare, and against cramming changes to these vital programs into a last–minute deal that could harm all of us," AARP announced on its website. The progressive position, as expressed by Sheyman, is that middle-class and working-class families, the hardest hit by the Great Recession, most rely on those entitlement programs and aren't in a position to make more sacrifices — unlike the top 2 percent of taxpayers. If entitlement changes must be made, some progressives have floated the idea of giving Medicare the ability to negotiate pharmaceutical prices, a power Congress explicitly denied the program when it enacted the Medicare drug benefit in 2003. Or, they say, raise the cap on income on which Social Security taxes are paid past the current $110,100. But it's not at all clear that would appease Boehner and Republican leaders. 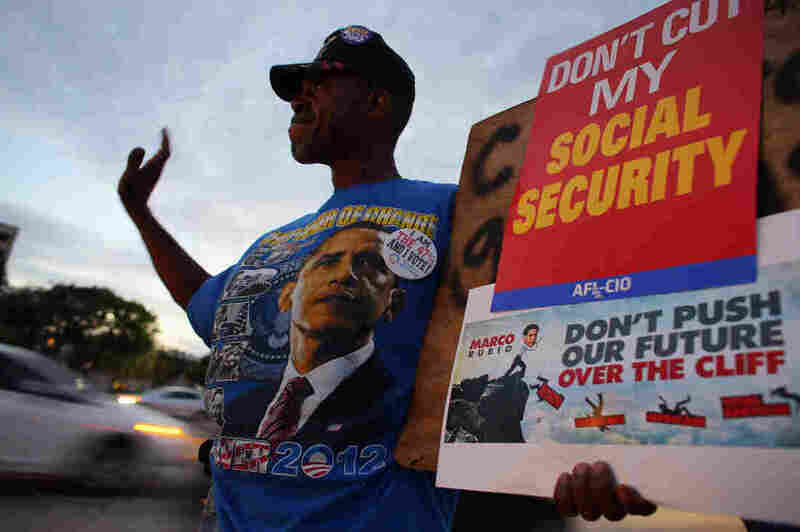 Which means the two sides have some work to do even in framing any discussion around possible changes to entitlements. "As the Republicans have become less intransigent on the revenue side ... the other side has become much stronger against any kind of reforms against entitlements," said Rudolph Penner, an economist at the Urban Institute think tank who was Congressional Budget Office director from 1983 to 1987, speaking at Tuesday's Chamber of Commerce event. "One thing that puzzles me about this, if you really project out to where we're going, to a sovereign-debt crisis, which seems to be inevitable if we don't change these policies, the people who are really going to be hurt are the poor," said Penner. "All you have to do is to look at southern Europe to see what's going on. Twenty-five percent unemployment in Greece and Spain. Imagine what the minority unemployment would be if we had a 25 percent unemployment rate on average in the United States."